We have not one but F I V E awesome deals for you to take advantage of today! Buy one year of A Healthy Passion and get 6 months FREE. That’s only $3 a month! Simplify your life with delicious and simple macro friendly recipes with the push of a button. Send your list to Instacart for home delivery in 1 hour. Start January off on the right foot! Buy one year of A Healthy Passion and gift a year (just email us info@ahealthypassion.com with the name + email of the person you’re gifting it to and we will send you a little gift card for them! Treat yourself to our software and cross one thing off of your holiday list this year by gifting a year to a friend (for free)! Order your copy of Healthy Cooking Redefined and get two months ($30 value) of A Healthy Passion FREE! Healthy Cooking Redefined the first cookbook by A Healthy Passion is designed to simplify healthy cooking. With 100 + recipes and cooking techniques you’ll learn how to cook while also feeding yourself and family well and enjoying the process! With dishes ranging from vegetarian to paleo and everything in between there’s recipes to fit every lifestyle. Technique based recipes that will actually teach you how to cook so you feel like a total rockstar in the kitchen. Full Color photos + step by step instructions with recipes! Books will ship out the first week of December making them the perfect holiday gift. Pre orders will receive free shipping and will be personalized and signed making them the PERFECT holiday gift! In Home Dinner Parties (Lexington only) $350 for up to ten guests (only 3 available). If you haven’t hosted a dinner party with me yet they’re absolutely THE BEST way to entertain. I plan a menu based on preferences / dietary restrictions / allergies / seasonality. You invite your guests/ clean off some counter space and pick up any alcohol you’ll need for your party. I show up with EVERYTHING for the party (even pots pans etc). I cook a 5 course small plates dinner which takes about 2 hours start to finish. You relax, have fun with your guests and enjoy delicious food. I wrap things up and take ALL OF THE MESS WITH ME! It’s pretty simple….use code TRIMHOLIDAY and get $20 off your next round AND get a TRIM Tank Top FREE! Once you sign up with the code, you will get instructions for choosing which round you want and getting your tank top. Pulling off Thanksgiving Day can be a little stressful without a plan so today I am sharing my tips and game plan for a stress-free holiday! 1 – Get Organized. Put together a game plan and stick to it. Write out your menu, make notes on what can be easily prepped in advance and reheated or even partially prepped (I shave my brussels sprouts days in advance and store them uncooked in tupperware). I also like to look at what takes time in the oven vs stovetop so I know how to best utilize my limited space and then I like to look at cooking times so I know when to start each dish to make sure they all come together at once. I love football food. There’s just something so cozy about a rainy fall day, cozy blankets, a good game on the tv, candles lit and a drink in hand. And while I wouldn’t call this buffalo cauliflower a substitution for buffalo wings the flavors are quite delicious. If you’re a buffalo wing lover this might be just the way to get you to enjoy those veggies. The initial reason I started thinly slicing rather than mincing my garlic was simply because it was less work. However, aside from any culinary corners I was cutting, I soon discovered that it added WAY more garlic flavor to nearly every dish! To set up your account, first go to ahealthypassion.com and click “Sign Up”. This will start you off with a trial account that’ll be available for you to use for FREE for the next 14 days – yay! This tool will be life changing. Get excited. ● Register by entering your zip code. There are some cool features such as grocery delivery with Instacart depending on where you’re located! (Use the code ahealthypassion15 for $15 off your first $35 Instacart order if you’re a new customer). Glass Bowl – I love a good set of nesting bowls for meal prep. I also own over 20 of these glass bowls from IKEA which work perfectly for prep and serving! Whisk – I own quite a lot of whisks and most of them are pretty inexpensive but I do recommend one good stainless steel whisk for making vinaigrettes, whipped cream or sauces! Prepping ahead can be a key tool to help you stick to your healthy lifestyle no matter how busy life get. Today I want to share some of my F A V O R I T E quick and easy A Healthy Passion meals perfect for those busy weeknights, lunches or those days when you just don’t want to cook! Each of them can either be easily reheated or served cold or at room temp! 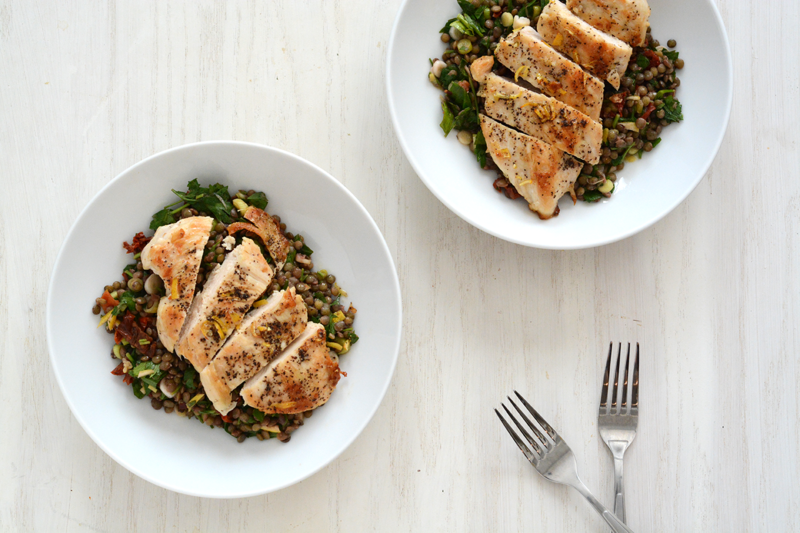 Feeling Too Busy – Cook This! Life is crazy, especially this time of year so today I want to share some of my F A V O R I T E quick and easy A Healthy Passion meals perfect for those busy weeknights! Each of them are less than 30 minutes, few ingredients, easy clean up and easily prepped ahead. 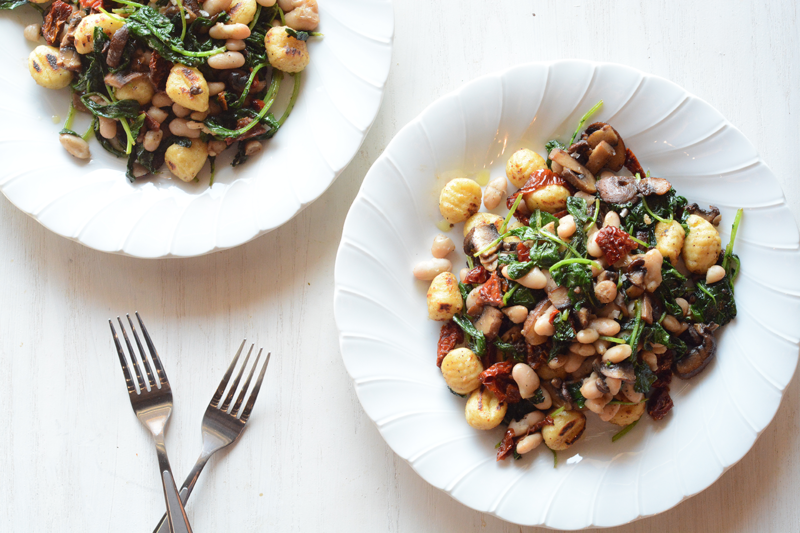 We toss fluffy toasted gnocchi, sautéed cremini mushrooms, creamy white beans and wilted baby kale in a buttery garlic sauce and finish with chewy sun-dried tomatoes for a 15-minute fridge-to-table weeknight delight! Speed it up: Buy sliced mushrooms! As the recipe developer for A Healthy Passion (or “head kitchen destroyer” as my team calls me these days), I spend a lot of time in the kitchen. Sometimes I almost feel like I live in there! But as a happy by-product of spending so much time in the AHP lab, I always have a formidable array of recipe testing leftovers in Tupperware, meaning most of what I eat from day to day is AHP meals. And let me tell you, that makes my non-kitchen life so much easier! However, I’m regularly asked what I cook when I’m not eating AHP leftovers and what items I keep in my pantry to do so. And with this in mind, I thought I would dive right in to what’s in my pantry.